The Handstand and Cartwheel are important foundation skills in the sport of gymnastics! If your child would like to learn a handstand/cartwheel or is working to perfect them, be sure to sign up for Jump Start’s Cartwheel Clinics! At our cartwheel clinics, we focus on upper body and arm strength. We practice spider walks, handstands, and of course… cartwheels! Students will practice drills, learn techniques, and develop the skills necessary to perform a cartwheel! Pretty soon they’ll be cartwheeling all over the place! 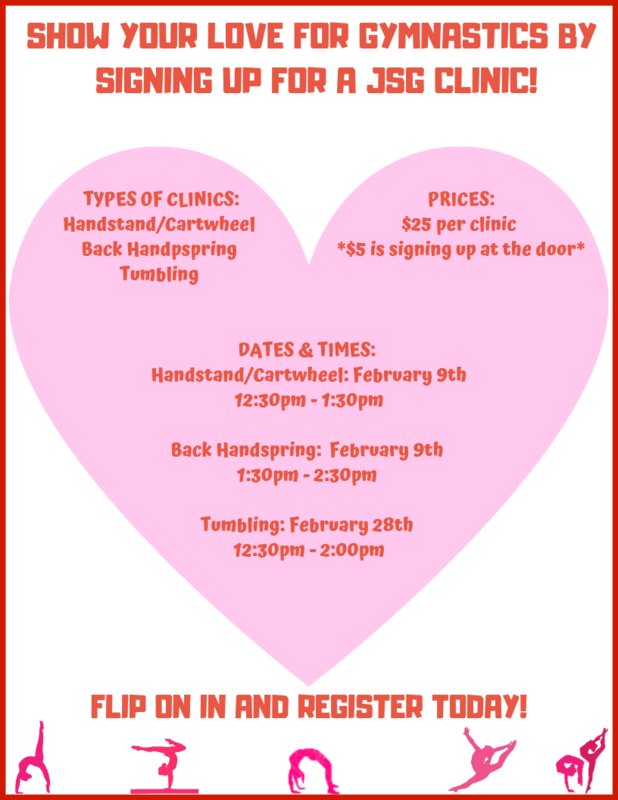 Whether your child is a gymnast or a cheerleader this this clinic can improve their tumbling. This 2 hour Clinic is for boys or girls who want to work on their standing back tuck, round off back handspring back tuck, front tucks, layouts or full’s. The clinic will focus on how the back and front tucks are performed, and what strength exercises they can do to help them with these skills. The students will be able to utilize trampolines, tumble track, stations and our spring floor to help each student out in a way that best fits them. We will teach them the correct body positions and air awareness so they will be able to perform these skills to the best of their ability in a safe way. This class has a limit of kids because of the difficulty of skill. For many gymnasts (especially recreational gymnasts or those transitioning from rec to one of our invite programs) bars is the hardest event. This is because it is hard to build the strength required for bars in a 55 minute class once a week. Our bars clinics offer 90 minutes of conditioning, drills and skills for the recreational or competitive gymnast to help get that extra edge on what many consider to be the hardest event in women’s artistic gymnastics.